Takes 20 Minutes , serves 4. To prepare the peppers: cut each pepper lengthwise down one side from just below the cap to the tip. Turn the pepper 90° and cut lengthwise again. This allows the peppers to cook evenly throughout. Transfer the peppers to a medium-sized bowl, drizzle with a bit of olive oil and toss lightly by hand. Heat the grill to about 500°F. Grill peppers, turning them every few moments until the skin turns a golden brown. Return grilled peppers to bowl. Drizzle with extra virgin olive oil and balsamic vinegar. Add garlic and chopped dill and season with salt and pepper. Toss gently. 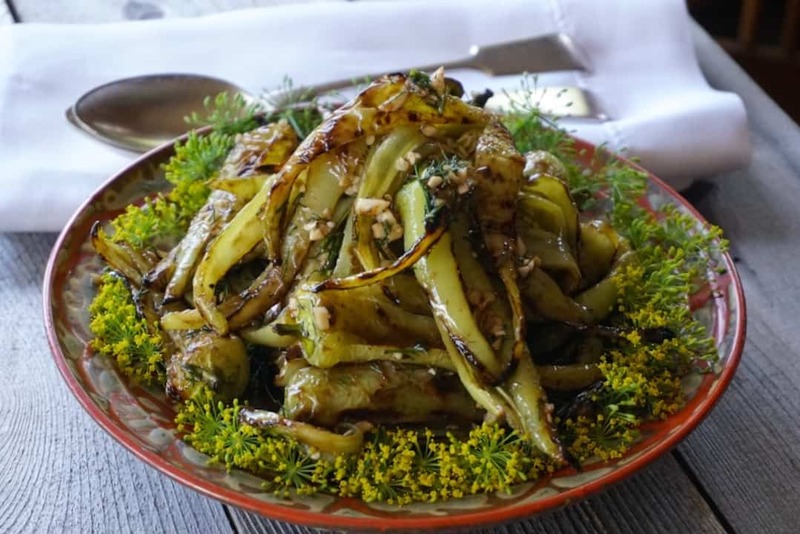 To serve: Lay the dill blossoms along the rim of a circular plate with the stems of the blossoms pointing inwards to the centre. Place peppers in the centre of the plate. Sprinkle with salt and pepper. Serve at room temperature. 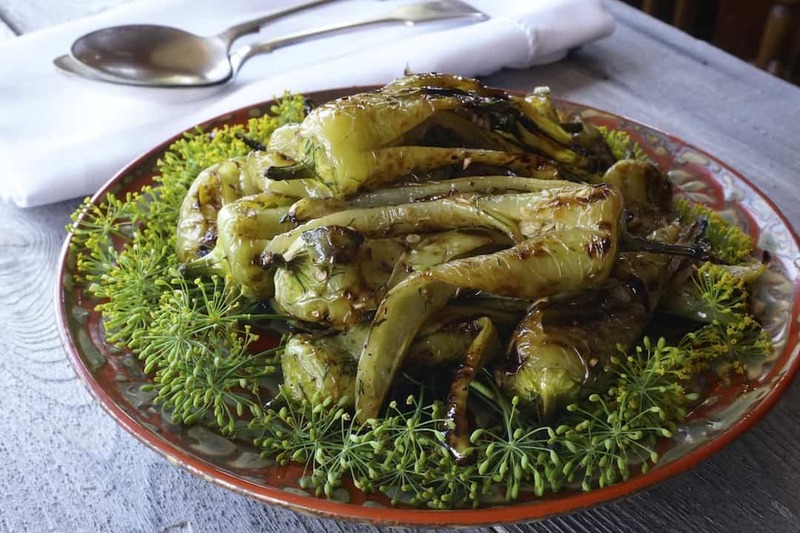 No matter what you’re serving as main course, this GRILLED SWEET PEPPERS SIDE DISH will be the perfect accompaniment. This recipe is a keeper and we’re confident you’ll try it and end up making it again and again. Make sure to BOOKMARK this page or PIN it your one of your favourite PINTEREST BOARDS for future access. Not a bad idea to tell your friends while you’re at it – they’ll love it too. This recipe was a big surprise for us. We originally slotted it into our content calendar as a simple, straightforward one-minute CITY SLICKER VIDEO that you could watch and replicate in no time (click HERE to see our City Slicker playlist on YouTube). Everything was going to plan; the ingredients were prepped, the barbecue was heating up and the presentation plate was sitting on the counter ready for the beauty shot. Then the peppers hit the grill, and the result was so amazing, we knew a quick video would not do it justice! 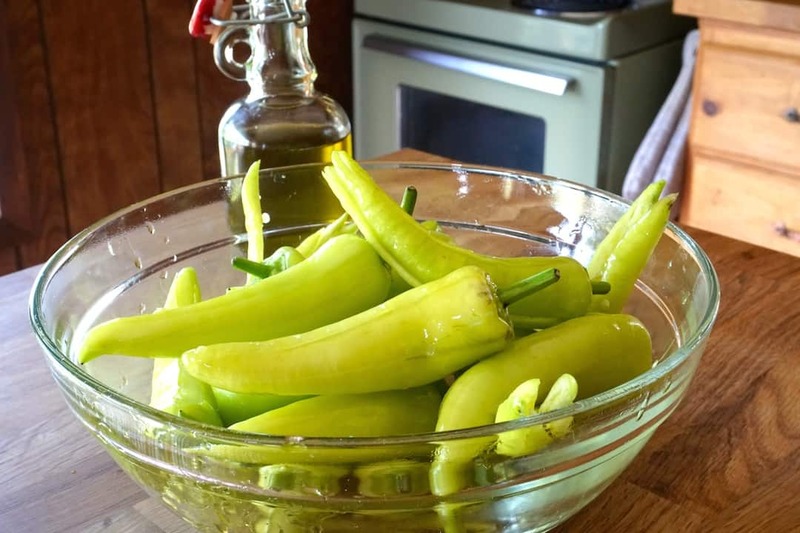 ITALIAN FRYING PEPPERS – I first saw these – dare I say cute? – little gems at a local farmer’s market up here in cottage country. The purveyor was matter-of-fact about their sweetness and that they had just been plucked from the pepper plants that morning. How could I not purchase them considering that inducement? 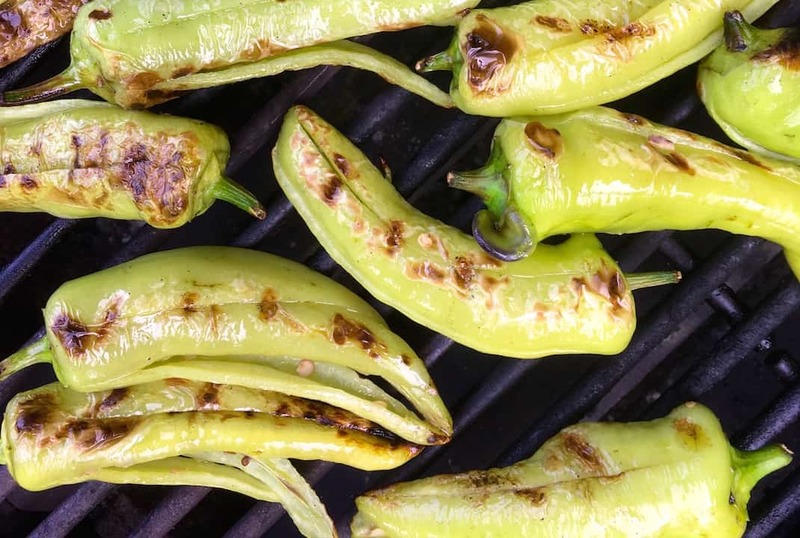 Cutting them just below the crown, from cap to tip, makes grilling them easy but also leaves them intact so that you end up serving whole grilled peppers, seeds and all. That in itself is pretty sweet. GARLIC – Finely dicing the three cloves of garlic before tossing on the grilled peppers immediately set off an olfactory overload. 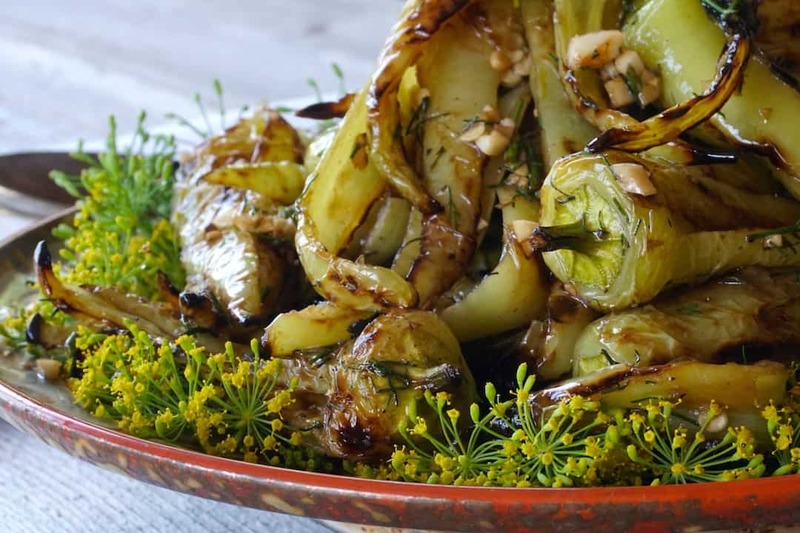 Just the thought of how this pungent culinary essential would play off of the grilled vegetable got us excited. 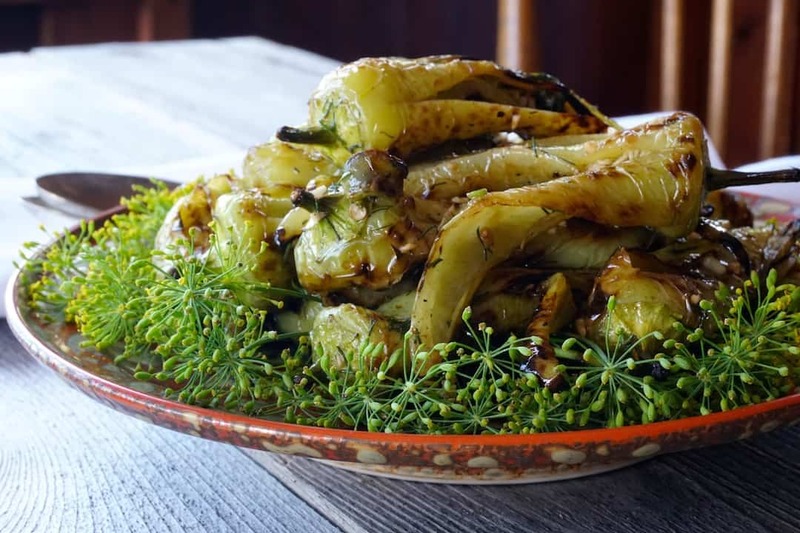 FRESH DILL – Chopping up the fresh dill had a similar effect as the garlic, but it comes with a caveat – when buying the fresh dill, look for large stems with the flower of the plant still attached. You’ll need the flowers to achieve the stellar presentation we’re recommending. 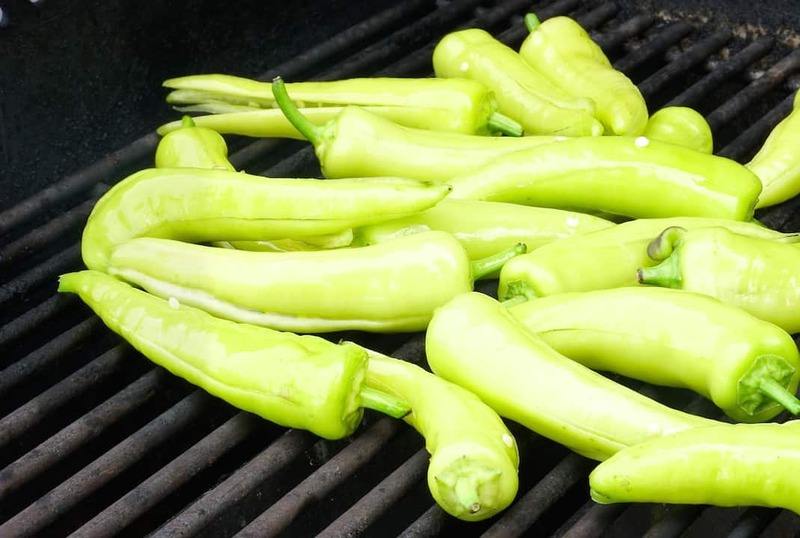 GRILLING – The grilling of the peppers need not be complicated. Grill them on a medium-high heat, about 500°F, and do so with the barbecue open the entire time. Staying close to the grill to turn the peppers every few moments is also suggested to prevent them from burning – the goal is to brown the skins, not blacken them. 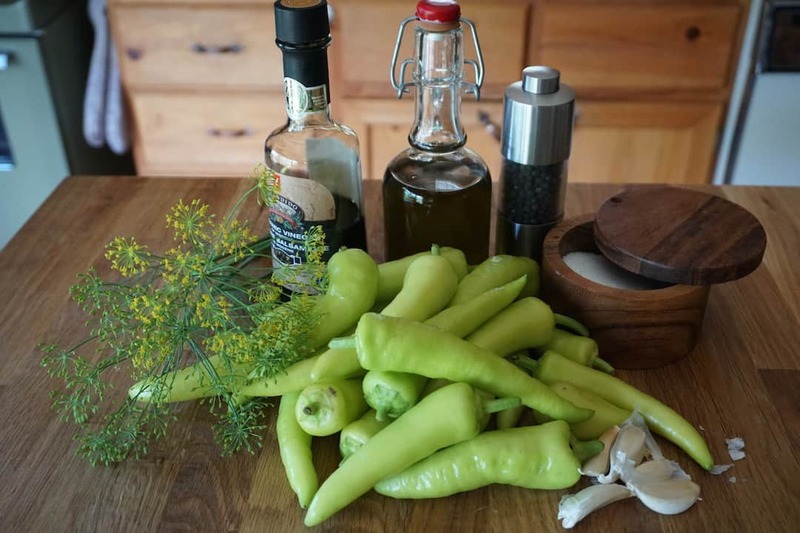 TOSSING & TIMING – The final assembly of the peppers involves nothing more than drizzling them with a bit of oil and balsamic vinegar before tossing them with the garlic, dill and salt and pepper to taste. After that, let the peppers cool down naturally before serving. They should be served at room temperature. 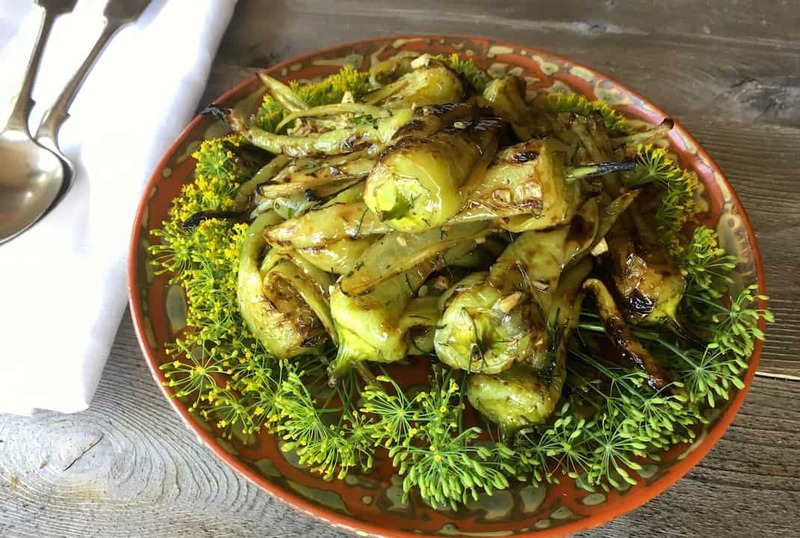 PRESENTATION – Presenting this GRILLED SWEET PEPPERS SIDE DISH can be a thing of beauty, especially if you have those dill flowers previously mentioned on hand. Placing them down like a collar along the rim of a round plate before you place the peppers on top in the centre of the plate completes this stunning look. We explained at the outset that this side dish is the perfect accompaniment for anything, and our suggestions stick with this claim. Try them with our GRILLED SALMON BURGERS, our PASTA PRIMAVERA or our MIXED GRILL. We know you won’t have any trouble enjoying them as much as we did. GRILLED SWEET PEPPERS SIDE DISH is your next taste sensation, just make them and discover for yourself!